Jason and I add a new segment of music ever other day or so and the time line continues to fill. Jason has enlisted the guitar talents of Opie Hendrix to add some free form overlays to some of the tracks. The music is going to be great. Continuing from the last post, an update on re-using a 50 year old lens. I received the adapter for the old Topcor lens (see picture – the black spacer thing between the lens and the camera). I did some testing with it and made a comparison with the new Zeiss lens. 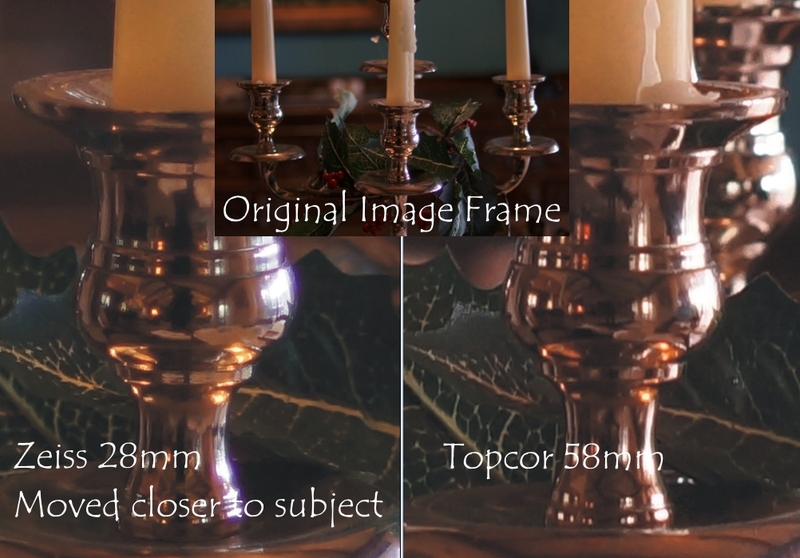 I took two photos of a candelabra in available light at f2.0 (using the stills mode of the camera that produces 4×3 images using the full 16MBs of the chip) . I had to move the Zeiss closer, as it’s a wide angle lens, to frame the same area as the Topcor. The photo below shows the area of the photo in the middle. Each lens recorded almost exactly the same image. The larger images are a cropped detail, in full resolution, for each lens. They are quite similar.